The story starts in the Tower of High Sorcery in Palanthus, which is under assault by the forces of the Kingpriest. The wizards, knowing they must surrender, remove as many valuable artifacts as they can. An elven wizard named Feal-Thas takes a dragon orb to the distant land of Ice Wall. 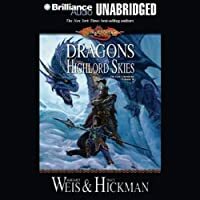 That orb is sought by the Dragon Highlord Ariakas, who assigns the task of its recovery to Kitiara Uth-Matar, half-sister of the sickly mage Raistin and his good-natured twin Caramon. Kitiara, who is rising up the ranks of the dark forces, must undertake the journey to the Ice Castle of Feal-Thas, where she will have a dramatic confrontation with Laurana, a leader of the forces of good.